Started ascent of Lug from Baravore car park at 14:43. Followed track past the youth hostel then swerved back to follow track to Fraughan Rock Glen. The track to the 2nd coum is clear and easy to follow. Conditions were very wet and strong winds. Climbed the 2nd coum to reach the beautiful open basin looking up to Lug. Very wet and boggy. Due to heavy rain the streams running down from Lug were flowing heavily and were great points of reference for navigation. Quick break and then pushed on for the last 400m or so ascent. I took a direct bearing for Lug summit from the basin, however, I hit an almost sheer cliff with a doable gully ahead. The ground and rocks were very wet and winds were strong so I took another bearing southeast were I found an easier climb up to the next level. 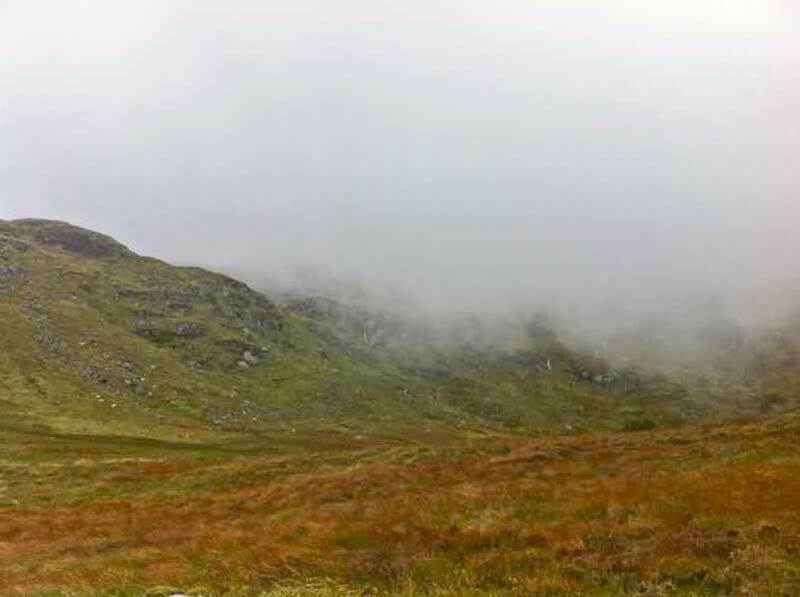 Visibility was now very poor as I was in thick cloud, heavy rain, and howling winds. I pushed on using my compass in hand to follow a bearing to the knoll NE of Lug summit, then changed direction slightly to reach the summit cairn. Care must be taken to avoid the south prison in such poor visibility.